During this time, based on Pvt. Perrine's (Company C) Previous diary statement, it is believed the 16th Ohio was camped somewhat behind the siege line and providing support for the 17th Ohio Battery (artillery). When a more specific location can be determined it will be presented on this website. 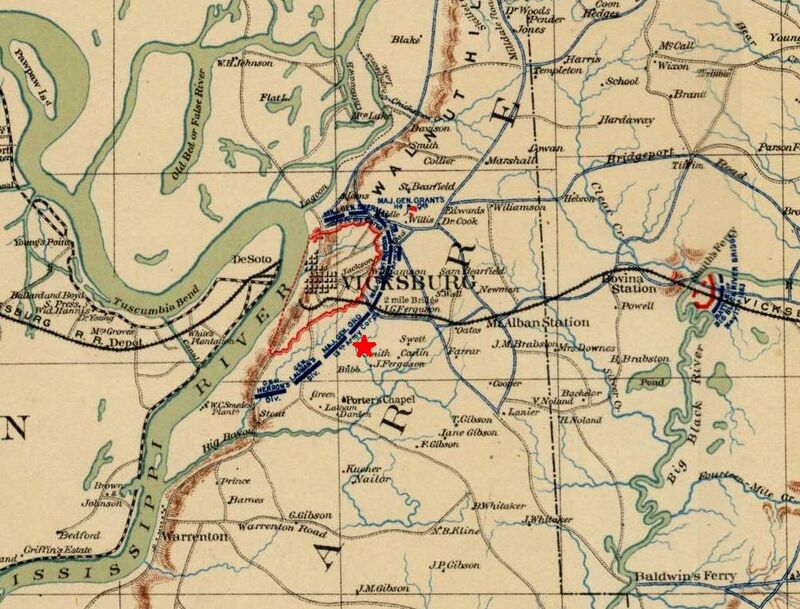 It is also known that the regiment, or elements of, performed various activities and may have been in many different locations around Vicksburg during the siege. As information on the detailed actions of the 16th Ohio on specific days during this time period is somewhat sketchy, various events and descriptions of this time will be presented in a general fashion and associated with specific dates whenever possible. Recurring to these seige [sic] operations, the order of minor events are jumbled in the memory. Sometimes, for amusement, the boys held their caps up on ramrods or sticks to have holes shot through them. If the rebels didn't fire at them the boys often got careless and poked up their heads to take a look. Eli Stewart, of Co. B, in doing this had a bullet put through him. In three weeks he was around again and in a short time was as sound as ever. Lowery, of Co. I, while getting water at an exposed spring back of the lines, received a rifle ball in the pelvic region. The surgeons with difficulty extracted the ball. This man, at Chickasaw, was saved from death by a momorandum [sic] book in his blouse pocket. A bullet struck it with sufficient force to crush almost through it. Sergeant James McBride, of Co. H, got struck on the head. Though stunned and bleeding his wound was not serious. When the stretcher bearers were taking him to the rear, he recovered consciousness, leaped from the stretcher and made his way to the surgeon without assistance. John McCluggage, of Co. E, while raising his rifle to take aim, had a bullet strike the gun stock near the rear band, forcing its way through between the ramrod and barrel and making a painful flesh wound in the left hand. A Co. A man, lying in bivouac back of the trenches was wounded in the foot by a descending bullet from the rebel lines. The image below of a portion of the Vicksburg battlefield, taken some years after the war, shows the rugged terrain described by Cpl. Wolbach. The exact location of this portion of the battlefield has not yet been determined.